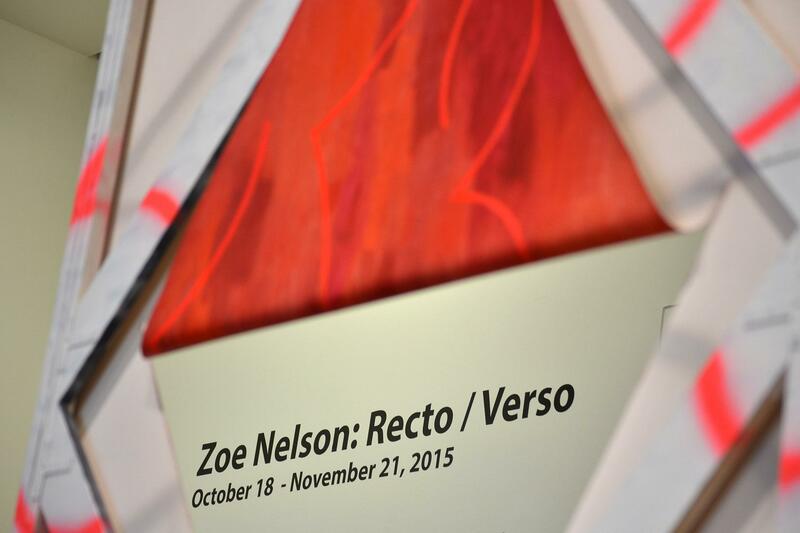 Vibrant colors, sharply cut edges and interplaying spaces are just a few of the tactics artist Zoe Nelson utilized in her first solo show “Recto / Verso.” Nelson’s playful installation pairs cut away canvas with energetic oil and spray paint, and utilizes all sides and aspects of the canvas. The show will be on display in College of DuPage’s Cleve Carney Art Gallery until Nov. 21. All of the paintings are strikingly individual from one another and could easily be viewed and analyzed on their own. 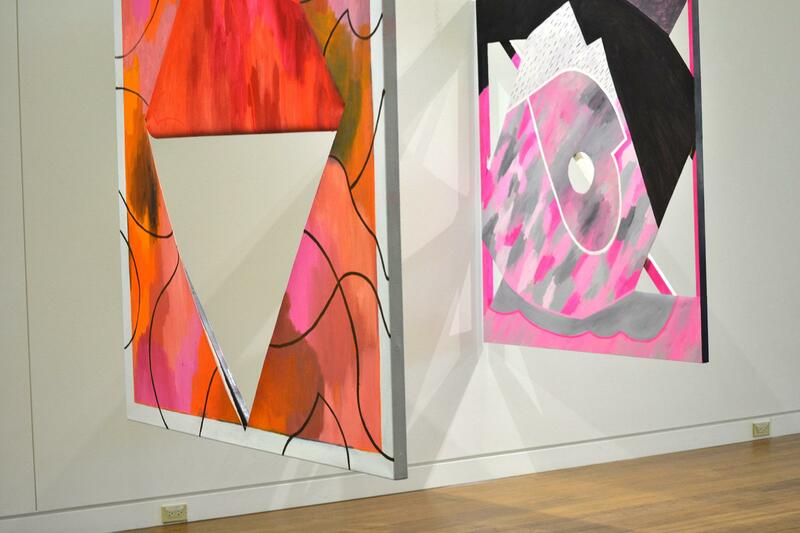 However, by slicing shapes and creating folds in the canvases, the artist allows her paintings to merge together when viewed at certain angles. 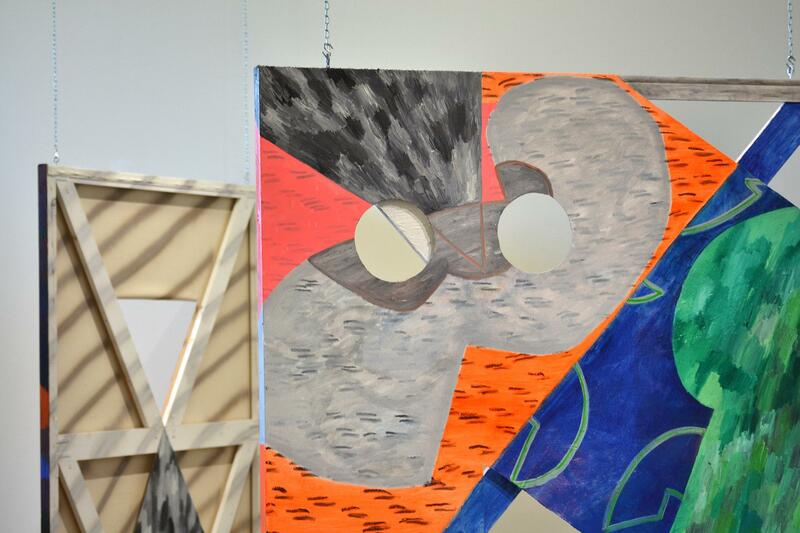 The cross bars used to hold the canvas taut are also made visible through the various spaces, and Nelson seamlessly incorporates them into her work as well. Nelson paid a lot of attention to not only where the paintings were located throughout the gallery, but how viewers could navigate through and around them. The large canvases hang from the ceiling or are bolted perpendicular to the wall, resulting is an eye popping landscape filled with movement and energy. “Recto/Verso” leaves much room for interpretation from the viewer. Given that the front, back, and sides of the paintings are all utilized, every corner of the gallery offers something completely new. The versatility is astounding- one could spend an hour peering through all the cut aways and standing at different angles and still find different, surprising viewpoints. Modern dance company the Leopold Group performed an interactive dance piece through and around Nelson’s artwork during the opening of the show on Oct. 18. Artistic Director Lizzie Leopold choreographed the dancers to mingle in and around the frames and the spectators, reflecting the paintings into movement. 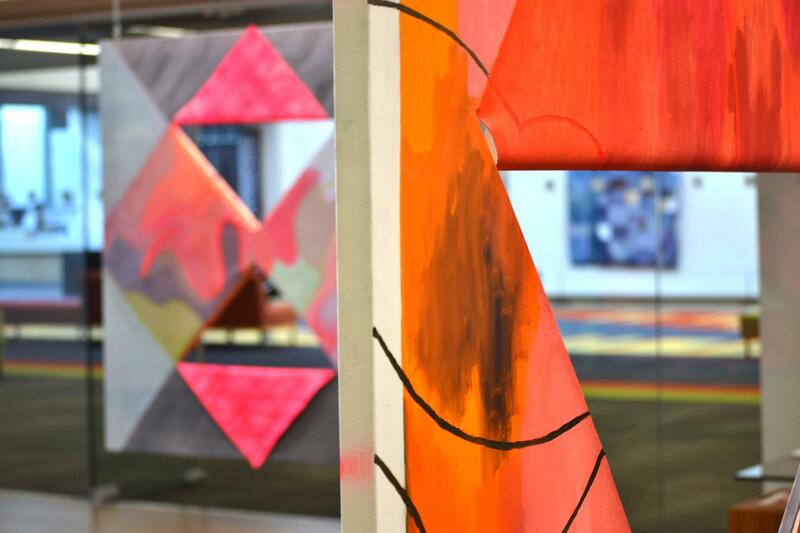 “It was really fun and interesting to see the space activated that way; seeing a collaboration happen beyond just the presentation, ” Justin Witte, art director of the Cleve Carney Art Gallery reflects. The Leopold Group is set to perform the piece again on Nov. 7 and 14, at 1 p.m in the Cleve Carney Art Gallery.